"We are so grateful for the amazing event you planned for Gold Star Family Day. The loss and pain will always be there, but to be reminded of why our fallen heroes sacrificed so much, is very meaningful. Thank you." 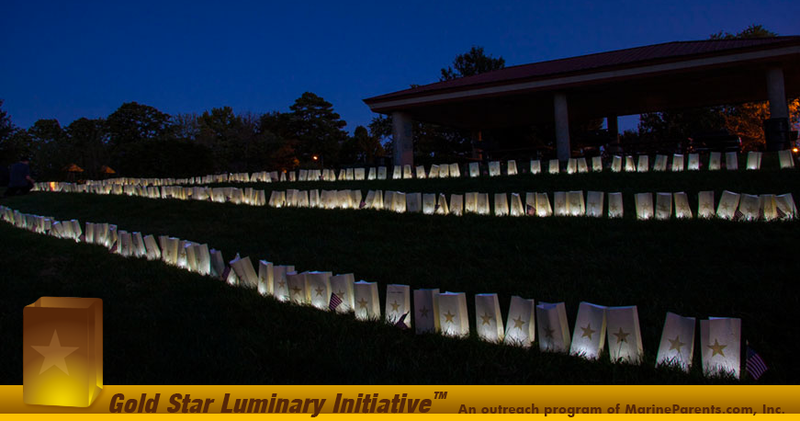 Since 2007, the Luminary Initiative has taken hold with individuals, groups and organizations lighting luminaries to honor Gold Star Family members around the United States; whether a few luminaries on a front lawn or hundreds in a community event, the impact is the same: the country shares your loss on this day and we want to keep their memories alive. Please help spread the word and light a luminary on the last Sunday in September. "We participated with our individual family this past year. We plan on extending the invitation next year. What a humbling time to give honor and respect to all those who have lost a loved one. Our prayers go out to all. Never a day goes by that I don't say a prayer for these families."